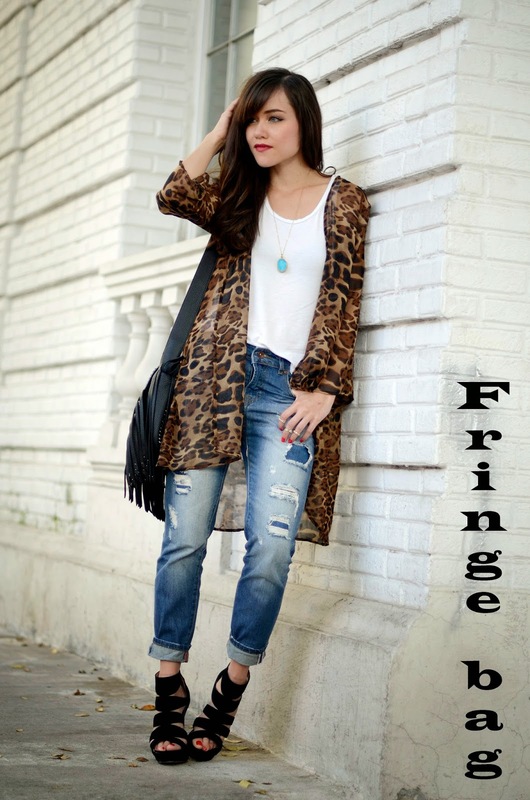 One of the biggest trends for this year is fringe, we are seeying fringes on every garment possible. If you are not of the bohemian style don’t worry becasuse you can adapt this trend to your look. A fringe bag is probably where to start, your fringe can be subtle and small or it can be long enough to plait and drag on the floor. Whatever bag you choose, this trend is flexible. 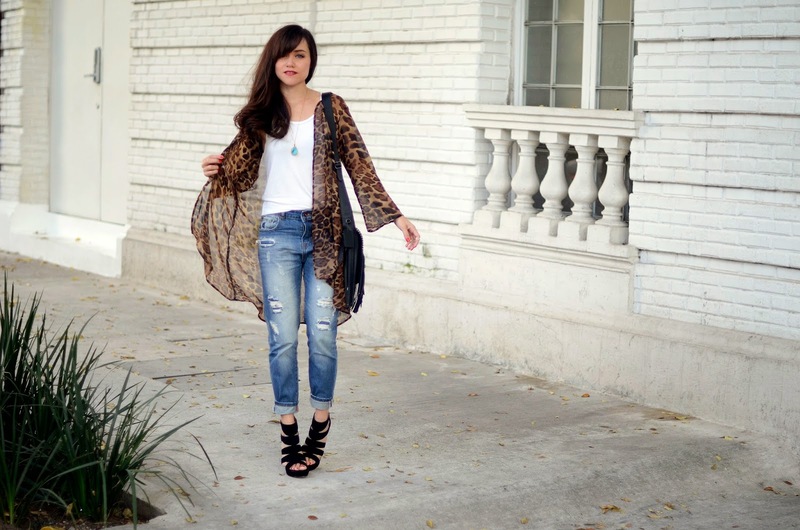 This time I combined it with boyfriend ripped jeans and a touch of leopard with my kimono. What do you think about my outfit? Hoy quiero mostrarles un look simple pero chic, llevo mi nuevo bolso de COACH justamente con flecos y no puedo estar más contenta con él. Me encanta porque siento que lo puedo combinar para un look simple o me puede quedar perfecto para una fiesta no demasiado formal por la noche. 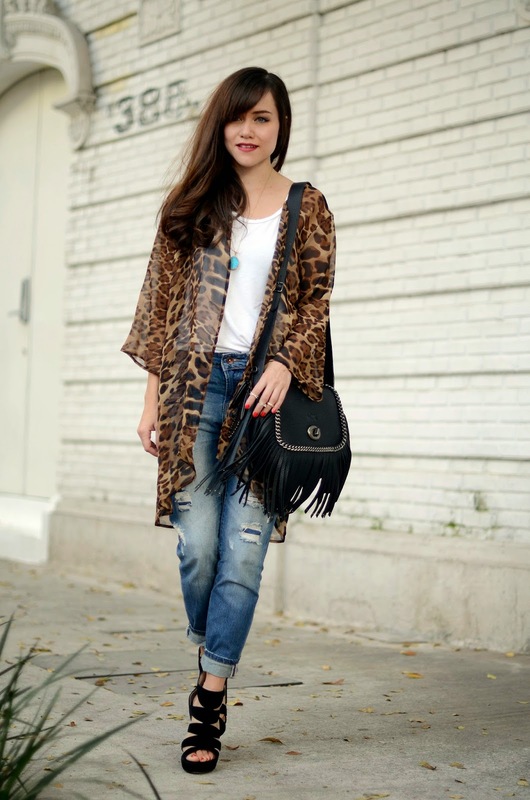 En esta ocasión combiné unos boyfriend jeans rotos con un kimono de leopardo. ¿Qué opinan de mi look? ¿Les gusta? ¡Que tengan un muy buen Jueves! Me encantan los flecos! y más combinados con esos jeans rotos. 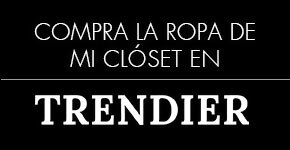 Cre que nunca me cansaré de los bolsos de flecos! El kimono me parece ideal para el conjunto que has elegido. Feliz día preciosa! ¡Qué hermoso, Gaby! Me encantan los flecos, aunque yo todavía no tengo nada en mi armario así :( pero pronto tendré algo. Love this look, I would defo wear it, perfect for everydays! Me encanta el look, pero sobretodo el collar. that sheer animal print cardi is to die for!!!! you look so stylish...such a perfect combo!!!!!!!! Love the jeans and shoes! Hola, genial el look el bolso es una monada, saludos. Me encantó el kimono de leopardo, te ves muy bien! y las zapatillas están geniales :)! wow me enamoré de éste look!! me encantan los flecos gaby! Wow amazing look. I love the cool leo kimono. Perfection! 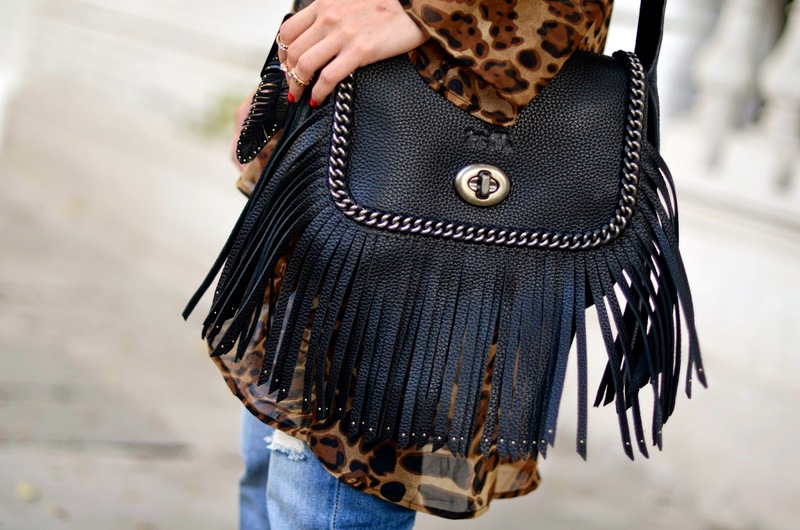 In love con el bolso y el Kimono leopardo!! Me encanta este look, súper casual pero súper chic! Besito Gaby y happy weekend! Very cute look and you are giving me idea for my next look :). Loving the bag and the Kimono. I am loving your style!! So Fabulous!! I love it!!! Your high heels are amazing! Another badass outfit, yey!! Love it! The perfect amount of chic to go with it! Looking fab amiga. Love the touch of blue from the necklace! Shopping News: Shopbop Big Event Sale! Magic Kingdom Orlando Day 2 and 3. Same black shirt, different outfit. Same pink skirt, different outfits.